Sure, you can accuse us of being overly complimentary, but mark our words, you’re gonna love this one. We put this newly-designed YXZ through its paces last week and when we say newly-designed, we mean it… and when we say paces… we beat the daylights out of it. We arrived at Stony Lonesome OHV park, near Birmingham, Alabama, on a scorching hot September morning and were welcomed by a cool blue sea of 2019 Yamaha YXZ 1000R Sport Shift models. Yamaha brought us to Alabama to test them in what they referred to as “East Coast” trail conditions, something a little different from the way Yamaha has marketed the world’s first truly Pure Sport shifting SxS. Yamaha keeps close tabs on the profiles of its customers in each specific market. Naturally, YXZ customers tend to be sport-minded by a large margin. 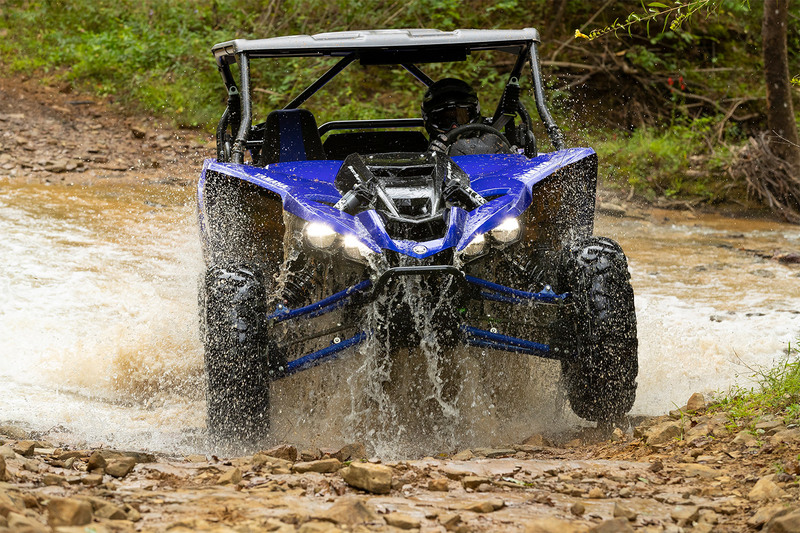 Only about 28-percent of YXZ 1000R customers lean toward using this vehicle for trail riding. The industry standard, however, clearly trends toward the opposite with about 70-percent being trail-focused riders. Clearly, Yamaha aims to expand its appeal to the trail customer with the delivery of this YXZ. Yamaha upgraded the 2019 YXZ SS with custom-designed 29-inch BigHorn Original tires. These 8-ply meats provide more traction, improved ground clearance and 33-percent more durability. There are also beefier disc brakes with larger rear calipers and stainless-steel brake lines. A larger bolt pattern upgrades the wheels. There’s a noticeable amping of torque. In first gear, acceleration is much stronger and as you rev this triple and paddle through the gears its thrust throws you back in the seat until you giggle. One of the most visibly noticeable changes is the movement of the radiator to the rear of the bodywork. This design change eliminates mud clogging-up the rad but Yamaha also made the radiator bigger with a triple intake system and added twin fans to create a claimed 300-percent increase in cooled air flow. Even with the radiator taking up space out back now, Yamaha maintained maximum cargo bed capacity and added four steel tie-down points. Accessories like a spare tire holder, spare battery kit, three different EFX tires with KMC wheels and an array of GYTR performance parts are also available. See www.shopyamaha.com. Besides subtle cosmetic cabin changes like the relocation of the gauge cluster, one of the most noticeable improvements in the cockpit is the reduced cabin heat. This is largely due to the radiator being moved out back. Yamaha claims there’s 31-percent less heat (less console heat, cup holder heat and driver’s back heat) in the cockpit and we were sure thankful for this riding in the extremely hot Alabama weather. The all-new FOX suspension also added to rider comfort with improved low speed damping and improved high-speed performance. Other nice suspension changes include new high flow internal valving, recalibrated spring rates and new spring and A-arm protectors. Depending on the YXZ model you choose, you’ll get a choice of three of FOX’s best Podium shocks. Our YXZ had the FOX 2.5 Podium RC2’s and soaked up ruts and bumps like a sponge. Yamaha has absolutely nailed the gearing on this one. The Sport Shift is so simple to operate and so responsive you’ll find yourself wanting to rev the engine to get more RPMs in the corners, then power shift out with your foot on the go-pedal. At slower speeds Yamaha’s engineering geniuses have the gearing set up to automatically find the best gear so the power is “right there” instead of having to search for it by clicking through the gears. From a dead start the launch mode is fun to use but the acceleration offered here without using launch mode will get you to the front of the pack quickly. As expected, Yamaha’s durability speaks for itself and you’ll get full value for your investment. Sure, we know the price tag is hefty (all quality Side x Sides are) but we’re guessing if you’re in the market to buy, you’ve already come to terms with this. We rode this thing hard and it kept asking for more. Next month Yamaha has invited us back to test the YXZ 1000R SS in the more wide-open out west. We’ll find out what the top speed is and let you know. Stay tuned.